It has been a long time since I wrote some movie reviews..
To catch up I'm comparing two animated films that I have just seen the past few days. One is the more commercially successful Ratatouille, and the other less-heard but highly acclaimed Azur Et Asmar. Commercialism notwithstanding, both movies were great. Ratatouille is now my favorite Pixar film, a much needed rebound from the less than appealing Cars. What's not to like..? With this film Pixar has not only reclaimed its title as the CG studio to beat, it has also elevated itself in the realm of the real Walt Disney classics. It is a when-you-wish-upon-a-star-your-dreams-come-true revisited, redefined as anyone-can-cook (or anyone-can-____ for that matter). Today was the last day of showing the film in Singapore - so I had to catch it in the big screen. 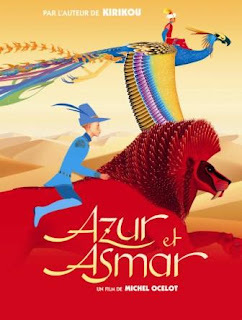 Azur et Asmar was a good film! While Hollywood studios jump into the CG bandwagon trying to achieve realism as much as possible (evidenced with that upcoming ridiculous Beowulf movie), Michel Ocelot (the director) has stuck with his trademark 2D graphical style. 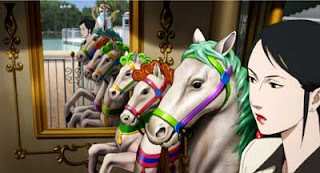 While the plain 2D artwork and occasional flat-shaded 3D elements were present in this film, it was done in such style and great artistry that the scenes depict some sort of a Klimt carnival. And the movie goes beyond its aesthetics - the story itself was full of positive values (from Variety: "..a modern, liberal sensibility informs story's plea for racial and religious tolerance, respect for women, and the virtues of cooperation and good manners."). The film ran with French and Arabic dialogue, but only the French parts were subtitled. Even so, the movie was intelligible during the Arabic parts, most of which had good humor (or so the audience felt). Studio Ghibli (Hayao Miyazaki's animation studio) acquired the film's distribution rights. Can't wait to see more of this sort of animated stuff.. Possibly Tales from Earthsea..